This Spicy Garlic Chili Rainbow Chard is a remarkable side-dish. The bright colours look beautiful on a plate. Chard is one of the most popular vegetables in the Mediterranean and Middle-East. Sauteed as well as raw, chard is utterly delicious. It has a pungent, bitter and salty taste. Sauteeing the chard adds a little more sweetness. As an excellent source of vitamin C, E, and A (in the form of beta-carotene) and minerals like magnesium, manganese, potassium and zinc, chard is also one of the most nutritious vegetables around. The dark leafy greens and brightly colored stems, stalks and leaf veins point to the many antioxidant phytonutrients chard provides, including beta-carotene, kaempferol, quercetin and betacyanin. Serve the Spicy Garlic Chili Rainbow Chard luke-warm with Quinoa Zucchini Raisin Salad, Quinoa Mint Lemon Tabouleh or Harissa Lemon Chickpea Bowl. 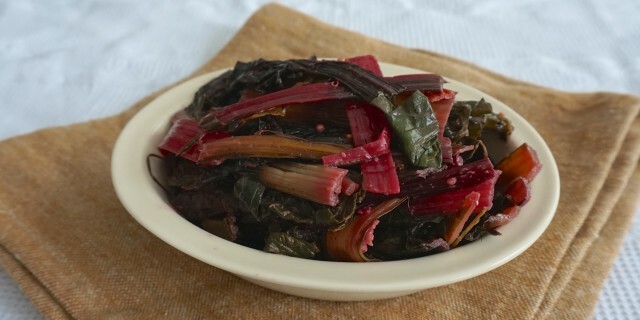 Wash the chard and chop off the thick, crunchy stalks. Roughly chop them and set them aside. Roughly chop the remaining chard and set aside. until slightly softened yet crunchy. Add the the remaining chard leaves and sautee until the leaves are slighly wilted. Make the dressing in a large bowl. Add the chard. Serve the Spicy Garlic Chili Rainbow Chard lukewarm with Quinoa Zucchini Raisin Salad, Quinoa Mint Lemon Tabouleh or Harissa Lemon Chickpea Bowl.